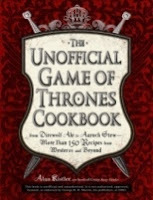 TheAngrySpark: Game of Thrones & Hunger Games... Cookbooks? Planning a viewing party for the upcoming season premier of Game of Thrones? How about dinner before you head off the the theater to check out the Hunger Games movie? How about some grub that matches the flavor (ahem) of the on screen action? If you're in the market for something to prepare for that magical night, Adams Media has a few suggestions for you. Both the Unofficial Hunger Games Cookbook and the Unofficial Game of Thrones Cookbook are absolutely packed to the gills with recipes. From the hallowed halls of King's Landing and House Stark in Westeros all the way to the feasting rooms of the mysterious Capitol in the world of the Hunger Games, you're sure to make yourself smile at some of these concoctions. While the residents of The Hunger Games trilogy’s Capitol gorge themselves on delicacies and desserts to their heart's desire, the humble districts fight for sustenance: Katniss and Gale hunt live game, Peeta's family survives on the bread they make, and the inhabitants of the Seam work twelve-hour days for a few handfuls of grain. The Victory Feast of The Hunger Games is the true reward for the ultimate fight for survival - filled with course upon course of delicious delicacies, rich stews, savory meats, and mouthwatering desserts! 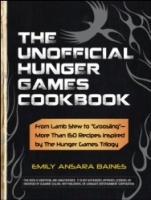 From these extravagant meals of the Capital, to the poor, but deliciously creative District 12, The Unofficial Hunger Games Cookbook collects recipes from the popular trilogy, including Katniss’s favorite lamb stew, French bread from the Mellark family bakery, and the decadent Capitol-Grade Dark Chocolate Cake. Piqued to get some of these epicurean delights cooking in your kitchen? Click right here to pick up the Unofficial Hunger Games Cookbook - or click here to snag the Unofficial Game of Thrones version. Both books will run you $19.99 USD, but are on sale right now for a paltry $13.57 each. A small price to pay to fill your belly... winter is coming, after all.